For the iPhone users, it can be a big headache to lose music from the library. There may be various situations when users face the problem of disappeared music from iPhone. In this situation, you never want to create the whole music library again because it will be very time consuming process. Now, don’t take stress to create the music library again in your iPhone because you can recover your disappeared music by using iMyFone TunesMate. When someone says that my music disappeared from my iPhone, this tool will provide the best advantages. 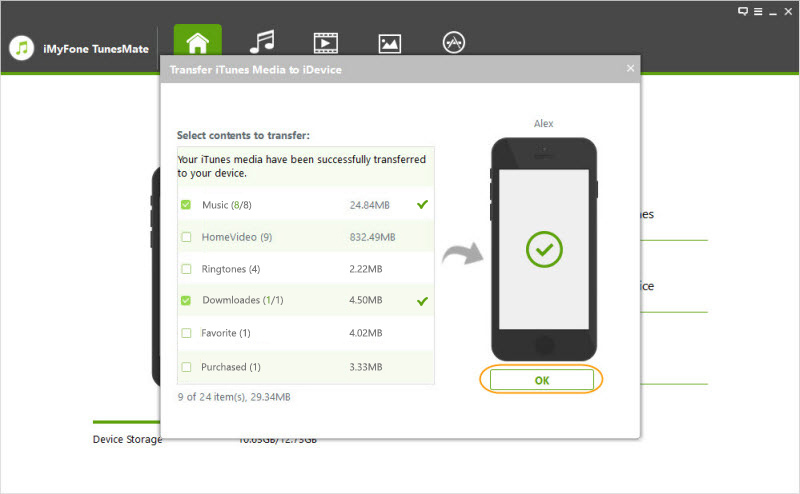 The options to transfer unlimited files from your iTunes to an iOS device. No limitations of data transfer from iTunes. Complete the sync of iTunes library with your iOS device without overwriting the previously transferred data. Effective to rebuild the corrupted or damaged items library. Recovery of all kinds of media files including music, photos, videos, podcast, ringtones, playlist and much more. Provides the good compatibility options with iOS devices. If all the music on iPhone disappeared, all these features will be very beneficial to restore it without any kind of inconvenience for the user. It is very easy to get and use this tool because you don’t have to face any kind of trouble to get it in your system. First of all, download iMyFone TunesMate on your PC. Install the tool and run it on your computer. 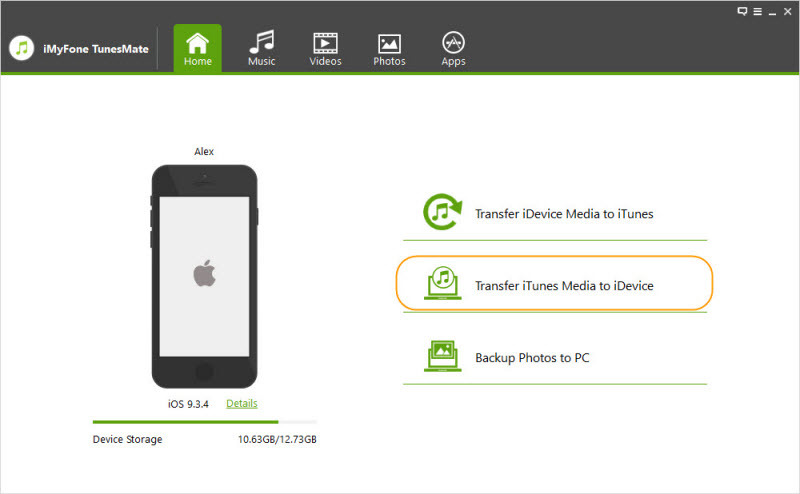 After completing the detection of your phone, click “Transfer iTunes Media to iDevice”. Select the specific types you want to transfer from iTunes to iPhone, in this case is Music. And click “Transfer” to start the transfer. Wait for the process to complete to get the desired music on your iPhone. At last, click "OK" button to finish it. It is the complete process that you can follow to recover the disappeared music on your iPhone. If all the music disappeared from iPhone 6s/7/8/X, these simple and quick steps will be very effective for it. In case of music loss, some users are used to sync their music to iTunes to make a backup. This must be a wise choice since they can retrieve their wanted songs from the backup while an accident happens. If you have synced the music from iPhone to iTunes beforehand, now you are able to get them back from the backups. Step 1. Connect your iPhone to a computer and run the iTunes on the PC. Step 2. After the connection, you need to select your iPhone and tap on the option “Summary > Restore Backup”. Step 3. Then you can select the most relevant backup from the list and click “Restore” to begin recovering the data. During the restoring process, you should keep your phone connected or it will fail. While looking for any kind of help regarding data transfer from iTunes to your iPhone, just find the perfect solution with iMyFone TunesMate. This tool is very effective to give the unlimited sync solution for the users who want to save the music for Media Library instantly in iPhone device. With the help of all this information, you never need to worry about any kind of disappeared music library or other media files in your iPhone or other iOS device is because you will be able to get it back by getting the complete information with us.